Map of enterprise zone on the Cornwall Airport Newquay site. The Kernow solar park is marked in yellow and the Aerohub business park in grey alongside the potential energy storage site (black). Image: Cornwall Development Company/Cornwall Council. Owing to the region’s high levels of installed renewables, connections of new generation projects are readily turned down, as Cornwall councillor Bob Egerton, cabinet member for planning and economy, explained. “Cornwall hosts a wealth of renewable energy resources… The current installed capacity of c. 700MW could provide 38% of Cornwall's annual electricity demand. However, a proportion, at times of low demand, is being curtailed or exported out of Cornwall. “When coupled with the fact that unconstrained connection offers for new generation are no longer available in Cornwall, electricity network constraints are beginning to impact upon commercial business cases, which is now a major barrier to strategic plans and economic growth,” he said. 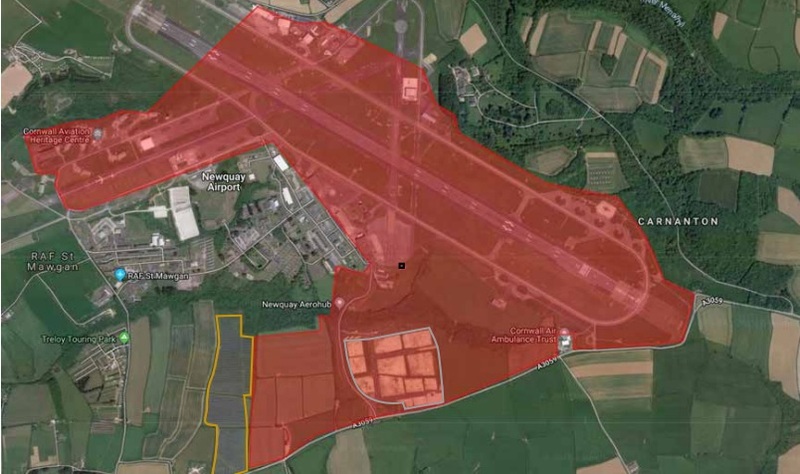 The proposed Aerohub site was one of six priority locations identified by analysis commissioned by the council due to the on-site demand of the airport and surrounding business and industrial premises, as well as generation from the nearby 5MW Kernow Solar Park. The Cornwall Airport Newquay site purchases electricity from Kernow Solar Park via a private wire to just 1.5MW of the solar development, which is split into three. The remaining generation is supplied via half-hourly metered connection to the electricity network. The council, which is working with Regen to develop the project further, is said to be open to a number of use cases for the battery. However, it has stated in a prospectus and request for expressions of interest (EoI) that adding storage to the solar park could offer a number of key benefits. This include helping to make best use of the renewable electricity generated, further reducing the need to import electricity on site, and help Cornwall Airport Newquay reduce its carbon emissions. However, it is looking to the selected development partner or partners on the project to establish which revenue streams or optimisation techniques can be accessed to create a viable business case. For example, the Kernow solar park could be extended through the use of energy storage to increase generation capacity. This could be used to charge the battery and to play into ancillary services markets, or could be fed into the airport for increased use on site, with only 33% of the airport’s electricity needs currently met via the private wire. There is currently 1.5MW of solar PV connected between the Cornwall Airport Newquay and the solar farm via a private wire to the St Columb Major substation. This is sold to the airport at a slightly reduced rate of 15% on retail price. The private wire is rated to be able to take up to 6.7MW of capacity, and there is therefore the potential to increase the energy delivered to the Cornwall Airport Newquay. There is also an additional southern grid connection to a second substation (St. Mawgan) which is currently where the remaining 3.5MW solar farm generation is exported to the electricity network using a separate PPA agreement. None of this electricity is currently directly used by the Aerohub site. The electricity supplier arrangements for Cornwall Council currently separate the sections of the solar farm and the billing of the import connection for the Cornwall Airport Newquay. Bringing these parts together under one electricity supplier/PPA arrangement using an energy storage system, as well as the demand from the Cornwall Airport Newquay, could provide some additional value that the council is interested in exploring as part of the project’s development. However, potential partners would have to evidence how such arrangements would any losses from current PPA arrangements. While the council is understood to initially be seeking co-investment in the project, it is also considering a lease model or owning and financing the project with a third-party to design, build and operate the battery facility. There is no timeframe or system size in mind for the project owing to the several variables and caveats within the circumstances of the project, as Regen’s project manager Olly Frankland explained. “The initial analysis came up with a wide range of sizes that could be applicable. It's quite an interesting site in that you have on site demand [and] a local solar farm so you're trying to match all of those and come together with a decent offer. “There could be some options on sizing and it depends on the grid - how much access you can get and what price - so we haven't specified that,” he told Current±. Responding to the EoI will put companies forward to be shortlisted, with a possible meeting with the council to follow. Depending on the responses received, and the result of further discussions, Cornwall Council may enter into contractual negotiations with potential partners, or proceed to a full tender process should the project go ahead.